Discover, experiment and create, based upon David A. Carter's book White Noise, in which, if you listen carefully, you'll hear what the sounds on every page are trying to tell you! 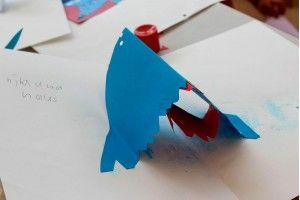 This pop-up book will help awaken your sense of hearing, and will also help you to create and to record your own sounds! ACVic Centre d’Arts Contemporànies (Sant Francesc, 1 Vic). 6 € per family. Pre-registration. By Bruna Dinarès, Bruna Sadurní and Elisabet Wenceslao with Assumpta Cirera-Tutiassessor of educational content. Families, including adults, with children from 3 years and up. Reservations may be booked either by filling in the application form, or by calling 93 885 37 04, until the closing date, Thursday 15th September, 2016. Please note that a limited number of places are available.